Dagri Rinpoche was born in Tibet in 1958. He grew up during the Cultural Revolution of 1966 – 1976 and escaped from Tibet in 1982. After Rinpoche’s escape form Tibet, Lama Yeshe committed to support the incarnation through Sera Je, and then when Lama Yeshe passed away, Lama Zopa Rinpoche took on the responsibility. Dagri Rinpoche completed his 17 years of study of Buddhist philosophy and received the Geshe Lharampa degree. From the time he was asked by Lama Zopa Rinpoche to teach at Nagarjuna Valencia in Spain at Saka Dawa in May 2002, his teaching schedule has been taking him to Europe and Asia, including memorable visits to Malaysia, Spain, Italy, the Netherlands and Switzerland; Rinpoche also teaches regularly at Nalanda Monastery in France. Dagri Rinpoche accepted to offer a commentary to Lama Tsongkhapa’s Middle Length Lamrim as part of the FPMT Basic Program at Istituto Lama Tzong Khapa in Pomaia, Italy, in 2012-2013. This Basic Program was unique in being university accredited as the Master’s in Wisdom course of Sant’Anna School of Advanced Studies (Scuola Superiore Sant’Anna) in Pisa, offered both residentially at ILTK and online. The teachings were expertly interpreted from Tibetan into English by Lotsawa Rinchen Zangpo Translator Program graduate Claire Barde, who has been working with Rinpoche on several occasions, both in Europe and in India. Geshe Sonam Ngodrub was born in Kardze, Kham, in 1968. From a young age he learned to read and write by looking at scriptures with his uncle at a monastery near his home. At the age of 13 he left Tibet and undertook the journey to India to begin his formal monastic education in Sera Je Monastery. Having eventually entered the Lharampa Geshe class, he graduated among the top three of his year, to then complete a year at Gyurme Tantric College. 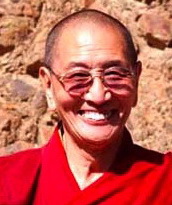 Upon returning to Sera Je, Geshe-la became one of the young teaching geshes in Sera, much loved by his many students. Invited to become resident teacher at Nalanda Monastery, Geshe Sonam Ngodrub taught a wide variety of topics, including several Basic Program subjects and a daily class on Stages of the Path (lam-rim) and Bodhisattva Deeds. Upon leaving Nalanda Geshe Sonam toured in Europe, teaching at various FPMT centers, until iIn 2012, at Lama Zopa Rinpoche’s request, he accepted to become resident teacher at Maitreya Instituut in the Netherlands, where Geshe-la was a much loved and appreciated teacher until completing his tenure at Maitreya Instituut in 2018. A physics graduate from MIT, Venerable George earned a Masters degree in Buddhist studies from Delhi University, India. He took ordination in 1975 and studied the Geshe Studies Program at Manjushri Institute, England, where he also served as Spiritual Program Coordinator. Venerable George was instrumental in founding the Masters Program at Istituto Lama Tzong Khapa in Italy, where he served as Program Coordinator as well. After studying and teaching there for eight years he spent several years at Tushita Centre in Delhil, followed by three years as Lama Osel Rinpoche’s English curriculum tutor at Sera Je Monastery in South India. Venerable George has done many retreats in the sutra and tantra traditions and taught extensively in FPMT centers all over the world. He taught the Basic Program as resident teacher at Dorje Chang Institute, New Zealand and at Land of Medicine Buddha, USA. After residing for several years at Deer Park Buddhist Center in Madison, Wisconsin, Venerable George currently teaches various subjects as a visiting teacher in FPMT centers. His extensive knowledge and clarity of explanation endears him to many Basic Program students. Geshe Jamphel Gyaltsen was born in 1968 in a small village in the Tsawa region of Kham, part of the Tibetan Autonomous Region. At sixteen he became a monk in the local monastery but wishing to engage in more extensive Buddhist education, went to Zogong monastery in Chamdo for his studies of Buddhist philosophy. In 1989 his second attempt to escape to India succeeded and he attended the Kalachakra Initiation in Varanasi; after an audience with His Holiness the Dalai Lama he went to Sera Monastery in South India, where after twenty-three years of study and debate he obtained the highest degree of Geshe Lharampa in 2008. Upon completing the traditional year at Gyurme Tantric College he returned to Sera, where he taught the youngest monks the basic philosophical subjects and acted as disciplinarian at his house, Tsawa Khamtsen. In 2009 Lama Zopa Rinpoche first invited Geshe Gyaltsen to become an FPMT resident teacher, but he had to decline the invitation. In 2012 he accepted Rinpoche’s request to teach the Basic Program at Nalanda Monastery. While waiting for his visa for France, Geshe-la had his first experience of teaching Westerners at Root Institute in Bodhgaya, and finally took up his teaching post at Nalanda in early 2014, joining the abbot, Geshe Lobsang Jamphel, as resident teacher at Nalanda Monastery. Geshe-la currently teaches the five year residential Basic Program at Nalanda for a second time. Geshe Gyaltsen is known both at Sera Je and at Nalanda Monastery as humble and very learned. At Nalanda Geshe-la has become highly appreciated for his clear and fluent teaching style, and the wonderful ability to explain the teachings in a way to which students can easily relate. Geshe Tsulga was born in Kham province in eastern Tibet to a nomadic family. He became a novice monk at the age of seven, entering a local monastery. When he was 17 he traveled to Lhasa and took ordination at Sera Je Monastery. During the mass exodus in 1959, he fled to India, crisscrossing the landscape over many weeks to avoid the Chinese patrols. Between 1961 and 1969 Geshe Tsulga lived at the refugee camp at Buxa in northern India, where he continued his studies with the many learned Tibetan refugees living there, among them Lama Zopa Rinpoche and Lama Thubten Yeshe. During the 1970s he participated in the building of Sera Je Monastery in exile in Bylakuppe, in south India, and although his studies were often interrupted he completed his Geshe Lharampa degree there in 1985. In 1990 Lama Zopa Rinpoche asked Geshe-la if he was interested in giving teachings in the West. At first doubtful about his capacity to benefit western students, Geshe-la asked Rinpoche to do a divination; when the divination came out positive, he finally accepted. From 1996 onward, while still leading summer retreats at Milarepa Center, Geshe-la has been the resident teacher at Kurukulla Center, where he taught the Basic Program from 2002 until his passing away in 2011. Geshe Thubten Chonyi was born in the Solu Khombu region of Nepal in 1962. He joined Kopan Monastery when he was 12, and was ordained by Lama Zopa Rinpoche. At the age of 17, he entered Sera Je Monastery in south India, where ffter 18 years of intensive study, he graduated with honors as Geshe Lharampa, to again excel in his studies at Gyudmed Tantric College a year later. Geshe Chonyi has been the resident teacher of Amitabha Buddhist Centre (ABC) in Singapore since 1999, and began teaching the Basic Program from August 2003 onward, attending discussion sessions, debating students’ answers, and providing ample questioning that engages all students and encourages them to take their BP studies seriously. By leading annual group retreats at Kopan Monastery, Geshe Chonyi also offers ABC’s Basic Program students the opportunity to fulfill their BP completion requirements. In this way, the first group of students was guided to their Basic Program graduation in 2010; a second round of ABC’s Basic Program started in June 2011. In July 2011, Geshe Chonyi was appointed abbot of Kopan Monastery and Nunnery in Nepal, becoming Khen Rinpoche Geshe Thubten Chonyi. He continues to serve as the resident teacher at ABC, where he is greatly loved and appreciated by his students for his depth of analysis of profound philosophical topics, and for his gentle good humor. Geshe Tenzin Tenphel was born in Tibet in 1956, but a few years later found himself with thousands of other Tibetans as a refugee India. While still a schoolboy in the south of India he developed a wish to become a monk, although his father only agreed to his ordination on condition that he complete his schooling. Eventually entering Sera Je Monastery at the age of seventeen, he studied and debated the great texts intensively until he was awarded the Lharam Geshe degree. In 1994 he also studied tantra for nine months at Gyu To College. Geshe-la arrived at Instituto Lama Tzong Khapa, in Italy, in 1998 and began teaching lamrim. In addition, he assisted with the teaching of supplementary subjects during the 1998-2004 Masters Program, and also taught at other FPMT centers in Italy. Alongside Geshe Jampa Gyatso he taught the philosophical subjects in the first residential Basic Program at ILTK. Geshe Tenphel is particularly appreciated for his clear explanations, his keen interest in debate, and his sense of humor, qualities that have endeared him to many Western disciples. In addition to his general teachings, Geshe-la currently teaches in ILTK’s Basic and Masters Programs, the subjects of which are a constant source of enthusiasm for his sharp analytical mind. Kirti Tsenshab Rinpoche was born in 1926 in the Amdo region of Eastern Tibet. When he was eight years old, he was recognized as the reincarnation of the former abbot of Kirti Monastery in Amdo, and ordained as a monk at the age of nine. A year later he made the arduous journey to Lhasa to continue his studies at Drepung Monastery in order to avoid the political instability posed by the Chinese in the Amdo area. In Drepung he became tsenshab (debate partner) to Kirti Rinpoche, debating with him and reviewing his daily teachings. After escaping from Tíbet in 1959, Kirti Tsenshab Rinpoche began a fifteen-year meditation retreat at the age of forty-five, in a small stone hermitage above Dharamsala, the residence in exile of His Holiness the Dalai Lama. 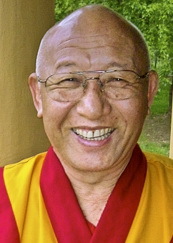 Kirti Tsenshab Rinpoche offered his commentary on Grounds and Paths of Secret Mantra in Vajrapani Institute in 2003 and 2004, based on the standard Basic Program text for the subject. After falling seriously ill in 2006, Kirti Tsenshab Rinpoche passed away in December 2006.